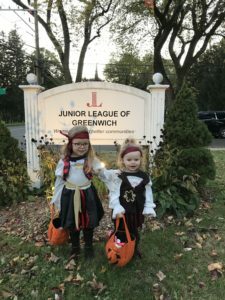 The Junior League of Greenwich (JLG) hosted Halloween Night for more than 100 Trick-or-Treaters at JLG Headquarters on East Putnam Avenue Tuesday night, October 31st. 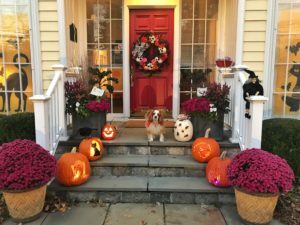 With the Junior League Headquarters located in the heart of a popular neighborhood for Trick-or-Treaters, the JLG invited local parents, kids, and pets to stop by for refreshments and candy. Many families used the house as a meeting point to begin their Trick-or-Treating down Park Place; a street known by locals for its many haunted houses on Halloween night. The Junior League Headquarters was decorated with black cats, witches, and spooky pumpkins on the front porch, which served as a photo backdrop for families to take pictures of their children in costume. The entire side of the house was lit up with dancing fire and ice lights, and the walkway and sidewalk were lined with black and white luminaries to light the way. The Junior League of Greenwich estimates that more than 100 children visited this year and is looking forward to making this an annual town tradition, serving the Greenwich community. The Junior League of Greenwich’s next family friendly event, The Enchanted Forest, will be held on Thursday, November 16th to Saturday, November 18th at Christ Church Greenwich. Tickets can be purchased at 501auctions.com/jlg.